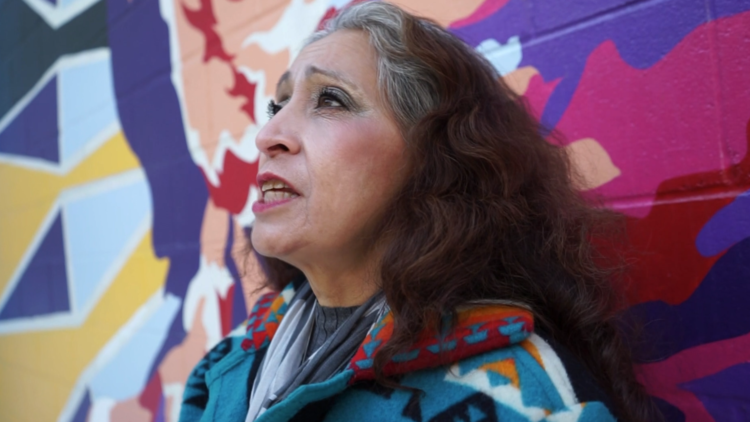 LaDonna Brave Bull Allard, a Dakota historian and director of Sacred Stone Camp in Standing Rock, recounts the fateful day that Tȟatȟaŋka Iyotȟaŋka (Sitting Bull) was murdered. “My name is LaDonna Brave Bull Allard, I’m an enrolled member of the Standing Rock Sioux Tribe and we are part of Sitting Bull’s people. Sitting Bull as you know, is a legend among our people but he’s also our relative, a family member, and goes down in history. He’s known by the whole world. What did Sitting Bull stand for? Resistance. What did Sitting Bull stand for? His people. Why was this important? Because Sitting Bull understood who he was, who his people were, and where he belonged in this world. Just as Sitting Bull did, we continue to stand with those same thoughts, ideas and memories. As we come up [to present day], and as I’ve said and have been saying, history’s repeating itself. In 1890 in September, The Bismarck Tribune was writing stories about the Indians “uprising” and the Indians “rioting.” We see the same thing today. Catch the Bear then raised his gun and as he shot Bull Head, Bull Head shot Sitting Bull in the side, Sitting Bull went down, then Red Tomahawk shot him in the back of the head. In a matter of seconds, Sitting Bull dies. And then the whole camp is in chaos. I don’t think at that time all the 47 Indian police understood what was happening. They didn’t understand that this man (Sitting Bull) had died. For us, it was the beginning a change in our lives. The leonard peltier defense committee notes that Obama is due to leave office in 20 days + + (a time clock countdown is there). They hope we can help to cause him to pardon him, although I haven’t called for ages, to say the humiliating truth. This entry was posted in resistance under oppression and tagged #NoDapl, la donna brave bull allard. Bookmark the permalink. That is a very strong narrative from LaDonna BraveBull Allard. Thanks for keeping up with this. We’ve had family visits this week. Great time with the grandson; sent him home with a rock collection for show and tell at school. oh, how wonderful that your grandson was with you, and how envious i yam. rocks i do know, so how wonderful. la donna is one of the few who does not want the snake to ‘be moved’, but killed altogether. she sees in her heart that anywhere downstream on turtle island will kill the tree of life, bless her far-seeing, seventh generation ♥. peace to you and miz, and enjoy your toasts and libations in preparation for a new calendar year. Good wishes for the New Year to wd and all. nice to see you, marym; mr. wd and i were just speaking of you t’other day and wondering how you are. thanks for the link; here’s irmaLinda’s twit account. i cross-posted there for awhile, but it didn’t go all that well, but then 95% of them are former kossacks, so…small wonder, eh? i’ve posted these dirty laundry pieces here before, but no one seemed to have read them. you may be able to handle them, i reckon. ;-) i think they’re very important in the narrative, myownself. a good new year to you, as well. don’t be a stranger.